Heading north on Arizona state route 64 from Williams, AZ and driving through Kaibab National Forest, it’s hard to imagine the earth split wide open. 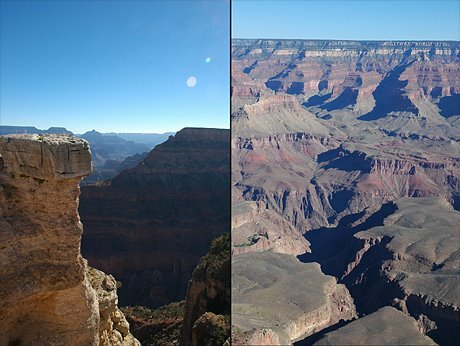 When you are standing at the Grand Canyon rim you have to acknowledge that your imagination not always suffices. I went down the canyon, following the Bright Angel Trail to Plateau Point. 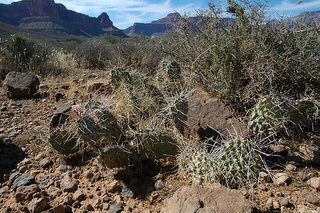 On the upper part of the trail the cactus vegetation was rather sparse, but after having passed the Indian Gardens and entered the Blackbrush (Coleogyne ramosissima) dominated desertscrub on the Tonto Platform, the cacti became abundant. 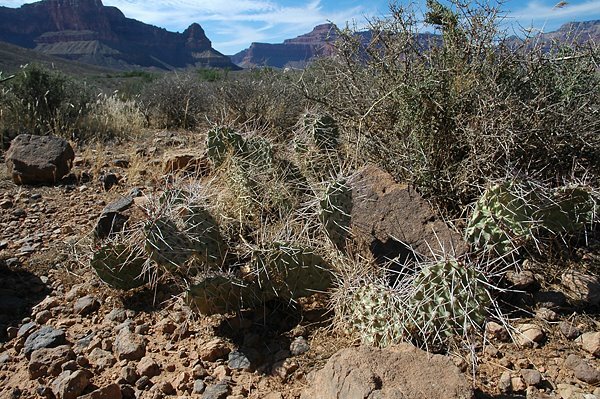 Especially Opuntias are massively present, almost covering the ground in some areas. I collected some Opuntia polyacantha var. hystricina seeds (thanks to the friendly people at the cacti_etc mailing list for helping me getting the name correct). The seed donor is depicted below. I’m aware that it’s absolutely stupid to sow cactus seeds at this time of year (in the Northern Hemisphere, that is ;-), but I couldn’t resist the temptation of testing the viability of the seeds. Prior to sowing I soaked the seeds for 14 days and after an additional two weeks in the ground 50% of the seeds have now germinated. I expected the seedlings to be “leggy” but was a bit surprised to see what looks like a tricotyledon? The Grand Canyon hike took place September 24, 2005. 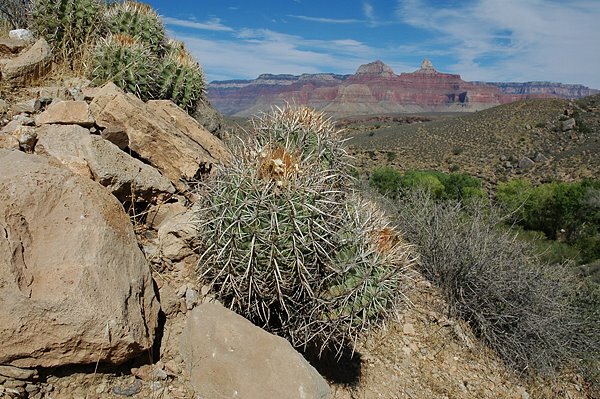 Additional photos can be found at Grand Canyon Cacti & Succulents. I love living in AZ, it's such a beautifull state to live in, especially if you love cacti. Although it does get quite hot in the summer, the winters are great.Thanks for sharing those pics, they're great. Pereskiopsis is a distant relative of Opuntia. Amoung many other reasons. 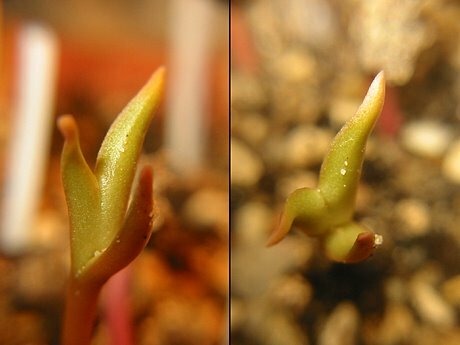 Another similarity is the ubiquitous glochids ;-) Anderson includes Pereskiopsis in the Opuntioideae subfamily – a standpoint confirmed by DNA sequencing research by R. Nyffeler. Speaking of beautiful Arizona, when would be the best time to visit to experience the saguaros in full bloom? The Saguaros usally start to bloom late may though june. I've always wanted to graft a saguaro seedling on pereskiopsis just for fun. 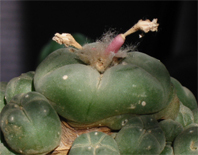 I might try to graft a fish hook barrell cactus onto pereskiopsis. I collected a couple thousand seeds last month from the barrell cactus all over my neighborhood. Each pod must have at least a thousand seeds. Hello- just a note on the Echinocactus in your great photos. It's Echinocactus xeranthemoides (treated usually, incorrectly IMO as a ssp. of polycephalus). Great blog! The recent post on the new Loph species is fantastic!